it was acquired by the United States in 1803, the Red River later served as a boundary between the States of Texas and Oklahoma. The exact location for the line of separation was challenged in 1920 soon after an extension of the Burkburnett Oil Field led to increased drilling activity in the area, including the banks and the bed of the stream. Since the Red River meandered, causing wide flood plains, the State of Oklahoma initiated a suit to determine ownership of the land. By authority of the United States Supreme Court, the disputed land was temporarily placed under the jurisdiction of the Federal Government. Frederick A. Delano, whose nephew Franklin Delano Roosevelt later became President of the United States, was named as the receiver in charge of the property. As part of his plan of supervision, he had a one-lane wooden bridge (2.5 m. n.) built to the center of the river, providing access to the drilling sites. 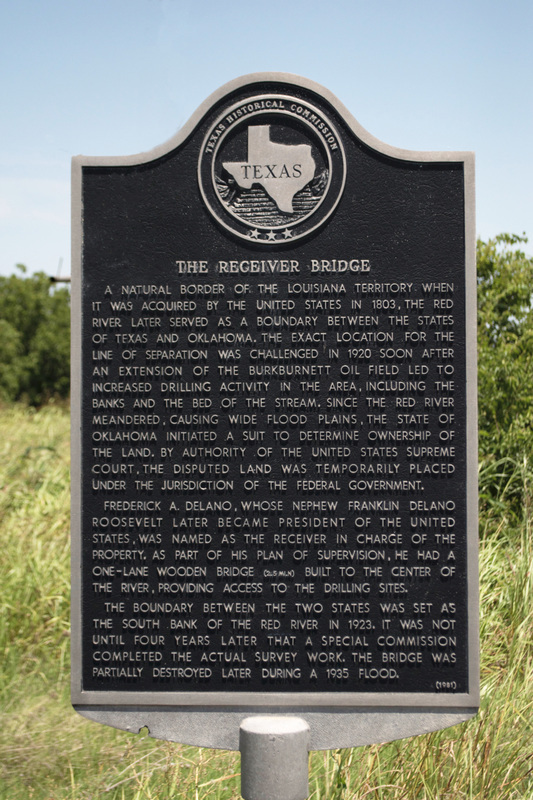 The boundary between the two states was set as the south bank of the Red River in 1923. It was not until four years later that a special commission completed the actual survey work. The bridge was partially destroyed later during a 1935 flood. Located on SH240 west of Burkburnett, Texas. GPS: 34-degress 05' 47.9 -98-degrees 41' 6.6".